While I love to cook, and it is a great source of healing for me during painful circumstances, I’ve not wanted to spend much time in the kitchen this past week. When someone you know loses a child suddenly, it really gives you a new perspective. For three days I did no cooking, cleaning, or laundry. I just held my baby. I watched him as he slept. I traced each tiny feature with my fingers, making sure I had him committed to memory. I got in as many bouts of laughing playtime as we possibly could. Now I’m ready to get back in the kitchen. I’m ready for soul food. Food that nourishes, comforts, and soothes. Food that warms me, fills me, and makes me feel good both emotionally and physically after I eat it. While I love authentic soul food, a lot of it is often too heavy for me. These sauteed greens are the perfect healthy soul food recipe. 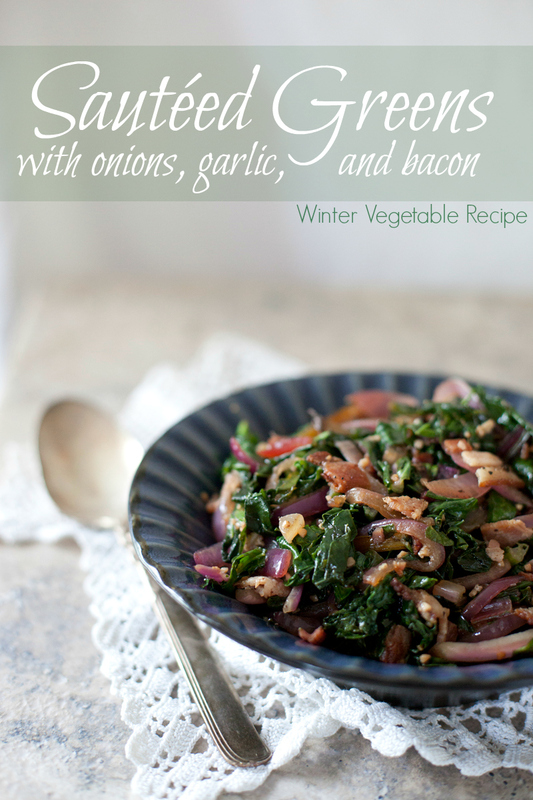 The hearty winter greens are sauteed with intensely flavorful onions, garlic, and bacon. It’s fast, simple, and immensely satisfying. You can use kale, swiss chard, mustard greens, or collard greens in this recipe. I like to serve it with roasted chicken or pork chops. While I love authentic soul food, a lot of it is often too heavy for me. These sauteed greens are the perfect healthy soul food recipe. 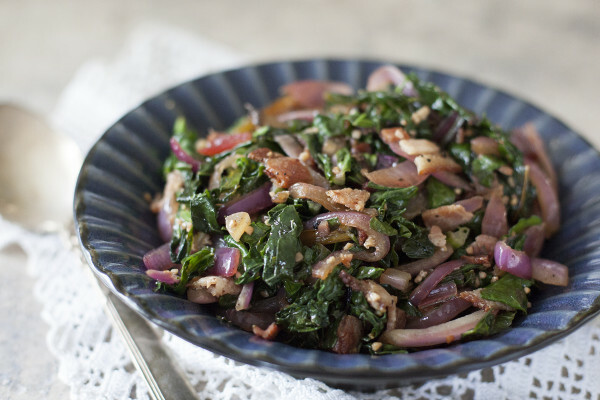 The hearty winter greens are sauteed with intensely flavorful onions, garlic, and bacon. It's fast, simple, and immensely satisfying. Chop the bacon and place in a large frying pan or wok. Heat on medium high, stirring slightly with a spatula or wooden spoon for about 3 minutes. Add onion and garlic. Continue stirring and cook about 5 minutes. Add greens, stirring to coat in the bacon grease. Continue stirring and cook a final 5 minutes, until greens are wilted. Approximate cost/serving: This is an affordable dish all year, though I prefer it in the winter. It usually costs me about $1 for a bunch of greens so it's just about $1.75 to make the dish. That's just 44 cents a serving. Vegetarian/Gluten Free: This is easily made vegan by skipping the bacon and using some coconut oil instead. It's already gluten free and dairy free. I am very sorry for your friend’s loss of a child. It really hurts and I can relate. I have lost one child to death and one to drug addiction. Thank you for the recipe. I have been looking for one for greens since I am trying to incorporate different veges into my diet and not rely so much on meat or dairy or wheat products. I like Swiss chard, so this will work and I have recently discovered I like onions as long as they are really cooked! Also, bacon makes everything taste better! So sorry to hear that Tonja, just heartbreaking. Totally agree on the bacon! Let me know how you like it with swiss chard.